Singapore Changi Airport has been voted the World's Best Airport by air travellers for the fourth year in a row at the 2016 World Airport Awards, held at Passenger Terminal EXPO in Cologne, Germany. 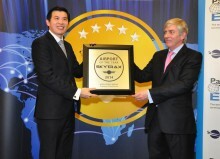 This is the 7th time that Changi Airport has picked up this top title at the World Airport Awards. To commemorate a year of exceptional service, Changi Airport Group (CAG) today paid tribute to Changi Airport’s every-day service heroes at its Annual Airport Celebration 2016. CAG honoured its top airline partners at the Changi Airline Awards 2015, where a total of 23 awards were presented to airlines whose efforts have contributed to the growth and development of the Singapore air hub. Themed SG50, the awards ceremony, into its 10th year, also featured the pioneer airlines that have been operating in Singapore since the country’s independence. Changi Airport Group (CAG) conferred its highest honours today to outstanding staff of the airport community. These are the staff that have gone beyond the call of duty and demonstrated exceptional service contributions in 2014, leaving deep and lasting impressions on both local and international passengers travelling through Changi Airport. Changi Airport Group (CAG) recognised its top airline partners this evening at the 9th Changi Airline Awards 2014. The annual awards ceremony, graced by Mr Lui Tuck Yew, Minister for Transport, celebrates the partnership of airlines operating at Changi Airport and their contributions towards the growth and development of Singapore’s vibrant and world-class air hub. 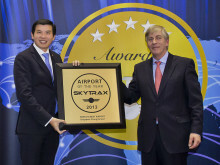 Singapore Changi Airport has once again been named the World's Best Airport at the 2014 Skytrax World Airport Awards yesterday, at the Passenger Terminal Expo in Barcelona, Spain. It is the fifth time Changi Airport has achieved this accolade and the very first time in Changi Airport’s history to win it twice in a row. Changi Airport Group (CAG) bestowed top honours on members of the airport community for their outstanding service contributions in 2013 at its Annual Airport Celebration ceremony held at Raffles City Convention Centre today. For the 27th consecutive year, Changi Airport was voted by Cargonews Asia readers as the Best Airport in Asia. To mark this unprecedented achievement, Changi Airport Group, who owns and manages Singapore Changi Airport, was also inducted into Cargonews Asia’s Hall of Fame. Changi Airport Group (CAG) honoured its top airline partners this evening at the Changi Airline Awards 2013, where a total of 34 awards were presented to the airline community for contributing to Changi Airport’s development as a vibrant and world-class air hub for the past year. This year’s Partner of the Year award was presented to FedEx Express. To commemorate another outstanding year of exceptional service contributions in 2012, Changi Airport Group (CAG) today paid tribute to Changi Airport’s front-line staff at the Annual Airport Celebration ceremony held at The Flower Dome, Gardens by the Bay.